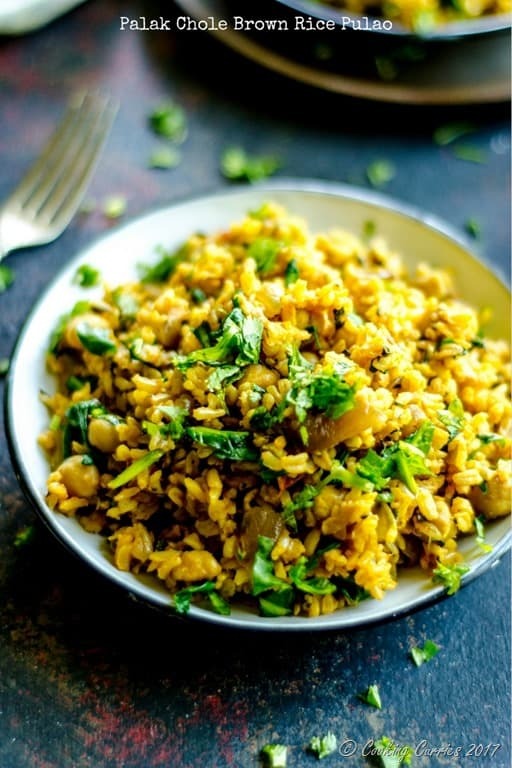 A filling and delicious one-pot meal of Spinach and Chickpeas along with some spices, this Palak Chole Brown Rice Pulao is the perfect way to use up any leftover brown rice you may have. Leftover rice. Now that’s a scenario that many of us are familiar with. Whether it is rice that you made at home or the rice you got with your takeout that you ordered last night. At least, in our household, there is always leftover rice. Especially if it is brown rice, it doesn’t really stay well as leftover rice and tends to stiffen up a little. If I want to use that as just rice, then I sometimes quickly microwave it with a sprinkle of water to perk it up with a little moisture. Or I make a rice dish with it, so it can use up the moisture from the other ingredients that I add to it. A quick pulao, or spiced rice, is something I love to make with leftover rice, especially leftover brown rice. I throw in whatever vegetables I have to make different kinds of pulao. 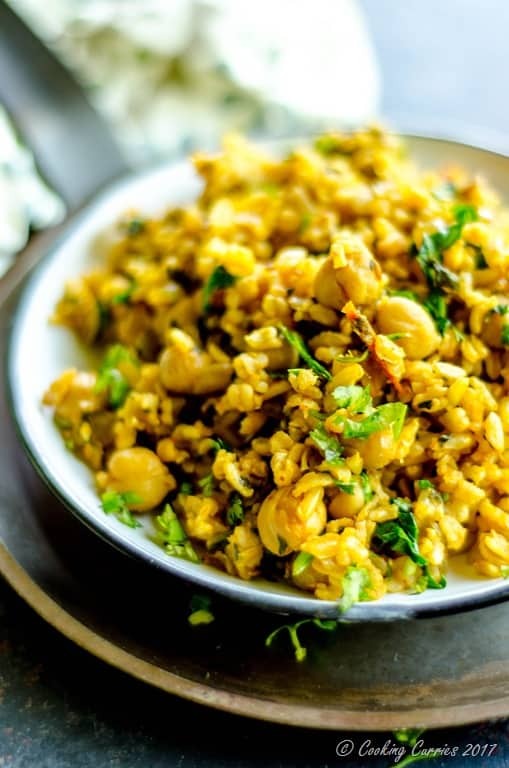 I especially love to add chickpeas, because it works well with the texture of the nutty, crunchy brown rice. 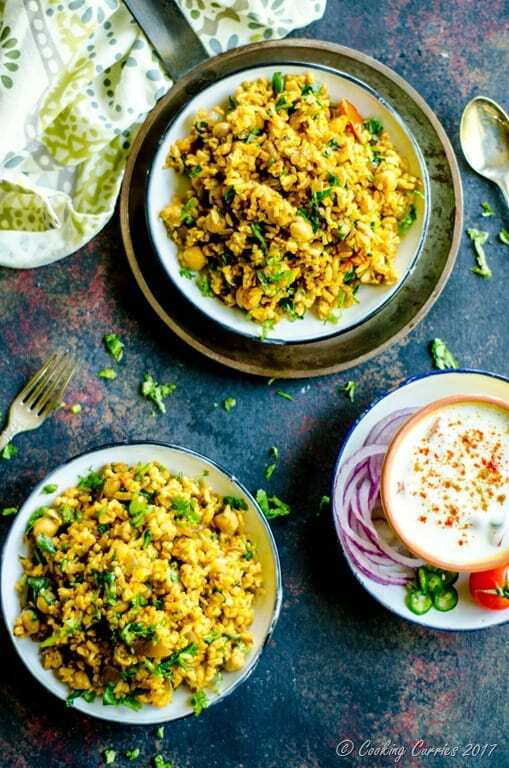 Spinach and chickpeas, both are very strong personalities as far as ingredients are concerned, but they complement each other in this wonderful and easily put together pulao. 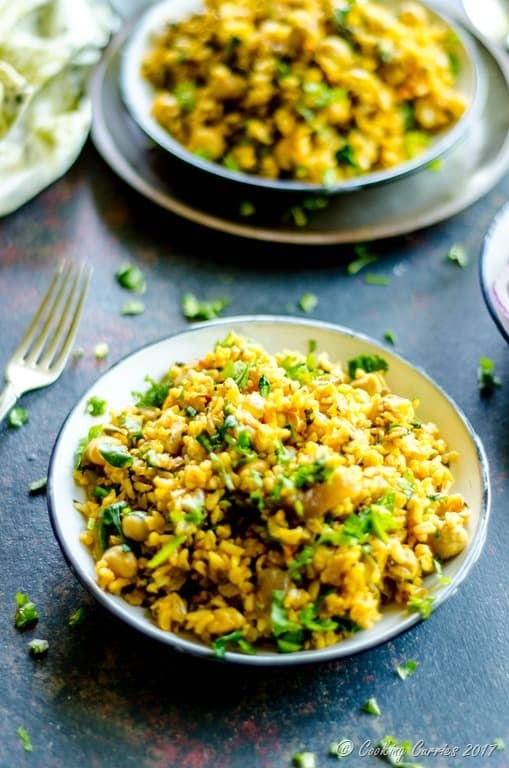 This is especially easy for a weeknight dinner, as all you need is to sauté all the ingredients together and toss it with the already cooked and leftover brown rice. Make a simple raita of any kind with some yogurt and cucumbers or onions and you are all set to enjoy a hot meal that looks like you spent hours making it. But, only you know the secret of that leftover brown rice! 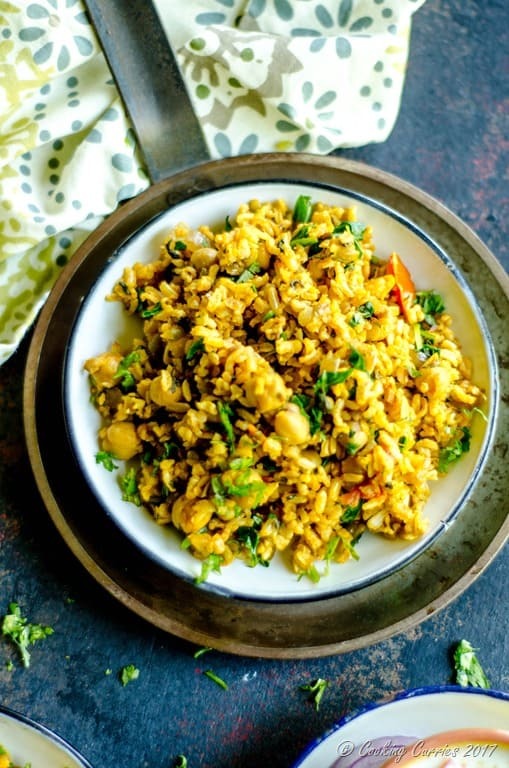 If you love this recipe, here are a few other rice recipes that you may enjoy. Heat the oil in a heavy bottomed pan. Add the cinnamon, cloves, green cardamom and bay leaves to it. Once the spices start to sizzle, add the garlic and onion. Saute till the onion softens and turns to light brown. Now add the tomatoes and cook till the tomatoes soften. Add in the turmeric powder, cayenne and salt and mix well. Now toss in the drained and rinsed chickpeas. Chop the baby spinach and add that as well. Let it cook for a couple of minutes with 1/4 cup water, till the spinach wilts and it all comes together. Now add the leftover brown rice to it and toss well. Be gentle and try not to mash the rice. 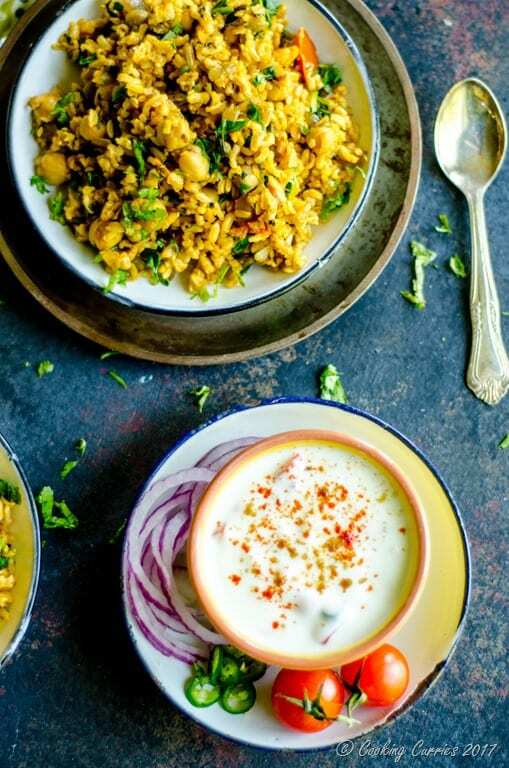 Garnish with the cilantro and serve hot with your favorite raita or just plain yogurt. Hey there! i found your post on google and i must say, it really is a great post and I enjoyed reading it. I only eat normal boiled brown rice for weight loss, suggested by the trainer, and never thought that they could be made like this also. Really happy to see that these are healthy too so, I can easily eat them into my diet schedule. Lots of love! thank you so much for sharing. Cheers! Of course! And this is a welcome change from regular brown rice. Hope you enjoy this! ?